According to Ayurveda, the change of seasons (referred to as Ritusandhi) can be a challenging time because we're most vulnerable to getting sick. Seasonal transitions are when the doshas are in flux (something you might already be feeling in your body-mind). They're also a time when your immune system works over time just to keep the mind and body balanced. 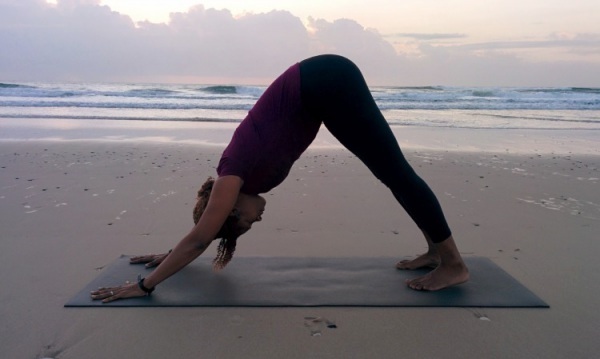 The great news is that there are a number of ways to boost your immunity and increase ojas, but if you're looking for a way to use your yoga practice during the change of seasons and beyond, to give yourself a leg up, the following poses are just the thing. Why it helps: This gorgeous little mini-sequence synchronizes breath with movement, which strengthens and calms the body-mind. It's all about creating harmony, which is the foundation for healthy immune function. The movement also supports lymphatic system function which relies on muscle contraction to move lymph around the body filtering toxins, wastes and unwanted materials that compromise immunity. Practice tips: Tuck your toes under for this version and press your heels away from you. As you drop into Cow pose, focus on broadening across the collar bones, expanding the energy at the heart center in order to energetically stimulate the thymus gland (which is responsible for healthy immune function). Why it helps: Gives the belly and digestive organs a nice massage, which helps to stimulate the digestive system. Well-functioning digestion is vital to keeping your immune system healthy and strong. The heart-opening action energetically stimulates the thymus gland as well. Practice tips: Broaden across the collar bones and lift from the center of your breast bone, supported from the navel center. Become aware of the energy running from your navel center to the center of your breast bone and back down. 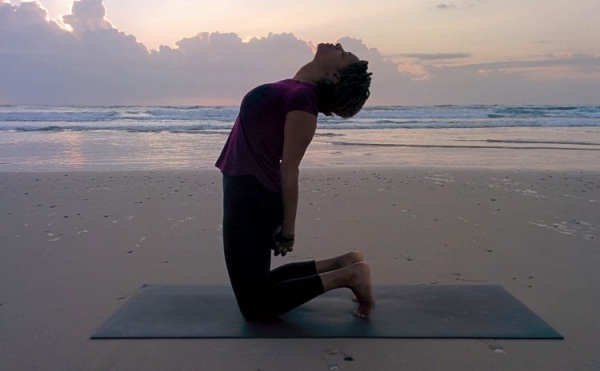 Why it helps: Heart-opening poses stimulate the Thymus gland, which is responsible for development of the T-Cells that stalk and attack viruses and infection. Practice tips: Focus on lifting from the center of the breast bone and broadening across the collar bone. Draw the navel to the spine to support the lower back. Draw shoulder blades together down the back as you work towards straightening the arms. Why it helps: Inversions are an effective way to activate and support the lymphatic system. Dropping your head below your heart allows the lymph to move into the upper respiratory tract and flow back down through the lymph nodes (filtering out toxins, etc.) as you shift to an upright position. 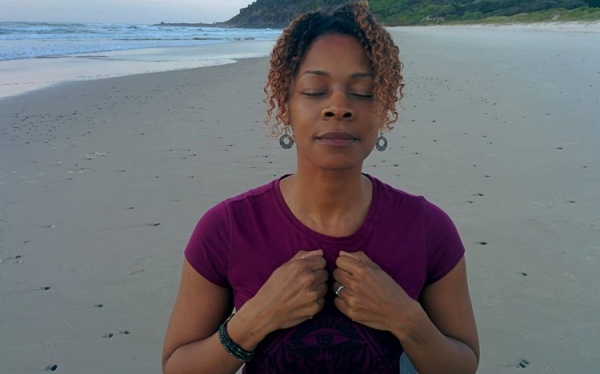 Practice tips: Release any tension in the head and neck (less tension means more flow). Relax the tongue on the upper palate. Consider supporting the head with a block to allow for complete relaxation of the shoulders and neck. Why it helps: I call this one a “Two-fer” because it's a sequence that acts as both a “lymph-pump” AND stimulates the digestive system big time (it's also a great sequence for relieving gas – hence the name). Practice tips: Soften the muscles of the face and neck and focus on keeping the shoulders and lower back relaxed. Initiate all movements from the navel center and radiate energy out and up the legs from there as you extend and move the legs through the sequence. Another way to kick your immune system into high gear and boost your energy instantly is to stimulate the thymus gland directly by... thumping it (yeah you read that right!). How-to: Curl your fingers into loose fists (thumbs on top) and gently tap the center of the breast bone slightly below where the collar bones meet at the sternum. Tap the hands gently back and forth relaxing the muscles of the face and shoulders and focusing your awareness on your breath, for 3-5 deep inhales and exhales. It's important to remember as well during this and every seasonal shift that the body and mind are inextricably connected; they are in essence, one. Your thoughts and emotions are just as important during this time as anything you do physically. So stay mindful as you practice yoga, because choosing to feel strong, balanced, and vital is the “secret sauce” that will get you there! Got any seasonal transition challenges? What do you love most about seasonal shifts? Acknowledge and celebrate in the comments!